THE PITCH: The cricket field is a large oval-shaped area, but all the action happens in a 22-yard-long rectangle in the center of the field. This is called the pitch, but sometimes termed the "wicket." At each end of the pitch are a set of three stumps, topped by two bails. These are the wickets. BATTING AND BOWLING: Each team fields 11 players; one bats, and the other team bowls. Two batsmen are on the pitch at any time, while one member of the bowling team bowls as his teammates field. 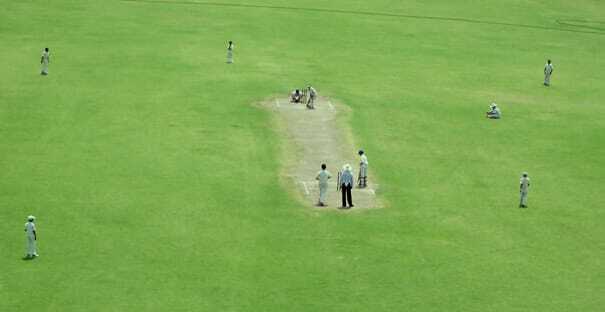 The bowler bowls the ball from one set of stumps to the other. He bowls six deliveries—known as an "over"—and then switches with a colleague.